Published: Dec. 31, 2017 at 04:56 p.m. Published: Dec. 17, 2017 at 01:26 p.m. Published: Dec. 3, 2017 at 05:13 p.m. 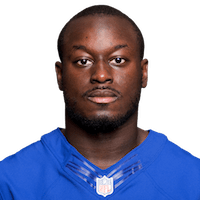 Published: Nov. 19, 2017 at 01:51 p.m.
New York Giants running back Orleans Darkwa powers through the offensive line to score this 1-yard touchdown.